The bus system in St Petersburg is an important part of the entire transport complex because it provides passenger transportation within the city, within the metropolitan area and links to other Russian cities and countries. 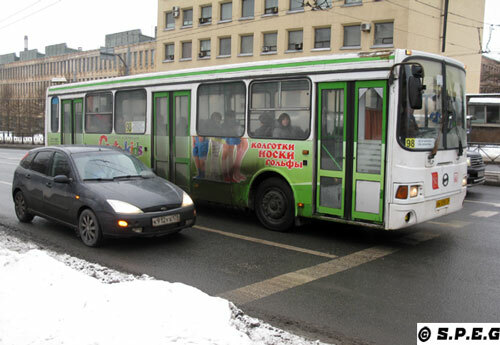 Typical local buses running in St Peterbsurg, Russia. However, despite the fact that the buses are cheap and cover many areas of the city that the metro doesn't, getting around St Petersburg by bus, as well by trams or trolleybuses is something that we would not really recommend to someone coming here for just a few days, even if it's a reliable and efficient way to go. First of all because for travellers and/or tourists like yourself it can be confusing and stressful if you don't speak Russian. For sure some locals will try to help you if you need or ask, but again, if you don't speak Russian it would be difficult for them to show you the way, and for you it would be tiring to explain or understand. Also, most of these buses run slowly due to the traffic jams and are often crowded, especially during rush-hours. And, if that is not enough, then let me add that some are even outdated, though things are slowly starting to change. With that in mind, if you come here just as a visitor, then we don't see the point of taking the local bus, or similar means of transport except if you have a specific reason or you are in company with a local guide or a friend. Personally speaking, it's rather better for you take the Saint Petersburg Metro as it is faster and easier to use. Still thinking of taking a bus? If so, before you jump on board learn how to go. To get started just click on a topic below to fast-track to that section. Every year 1200 million Russian people travel by bus in St Petersburg to go to work, come back home, and then move around the city on weekends. This explains why nowadays buses are important. There are so many of them, although fewer that in the Soviet era, and they're sometimes crowded. In fact during the communist era, when nobody could own a car because of the government policy of that time, the local public transportation was the only way for Russians to get around St Petersburg. So each bus, tram or trolleybus was always congested. Long-distance and international routes (Read Travel to St Petersburg by bus). Regular buses (avtobus) are usually green-and-white and nearly always have conductors on board. They accept travel cards. K-buses are privately operated commercial buses (the K comes before the number on the front of the bus). They can charge more for tickets, and will not accept travel cards. For your information, all bus stops are marked by signs with the letter "A", which stands for avtobus. Routes are indicated on window placards positioned on the side of each bus and listed (double-sided) at most bus stops, but only in Cyrillic. Also, remember that not all of the buses in St Petersburg have scrolling banners above the driver's cabin listing the next stop, but most of the buses now have been renovated, and some are new. Do you need to buy a bus ticket? If so, just open your wallet when you get in and you are all set to go. The same as for the tram or trolley, the cost of your bus ticket doesn't depend on the distance. Rather it has a fixed price of 40 Rubles ((€0.60/US$0.70)) for any single journey. 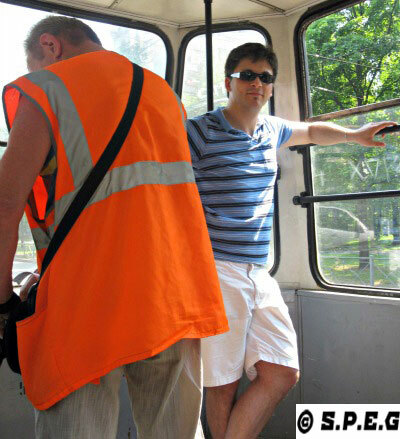 That's me (Davide) posing for a photo on a local bus. You will need to pay the conductor when you get in, or pay the driver as you exit the bus. How? Pay for your ticket by cash, or by checking your electronic pass on a card reader (the conductor may then check your card again). Anyhow, once you are on board the conductor will find you! So, you should just take a seat and wait for someone with an orange uniform to come over to you. Remember that when traveling by bus or with any Russian public transport in the city of Peter the Great, you should bring with you some coins or small notes because the people working on the bus usually don't have change. So, be prepared before you hop in! Certainly, if you need to, you can also buy a monthly ticket for all types of public services, though a monthly pass is only valid for municipal transport and not for the popular old fashioned Marshrutka. However, such tickets are more convenient for people intending to stay a long time in the city. In the event that you plan to stay more than five days, then maybe you should also consider buying the card Podorozhnik or a guest card. Just spent a night out in St Petersburg? Now looking for an alternative way to go back to your hotel that isn't a taxi? Since last summer, the local city administration has introduced some night buses in St Petersburg. Therefore, instead of taking a taxi, you could try to take one of these night buses and enjoy the city from a different view. However, as we've already said, if you don't feel confident to catch the bus, then try to avoid it. All the local public transportation with exception of the metro, are not an easy way to visit St Petersburg unless you have a local friend, or you know where and how to go. But if you insist on taking a bus, then take the one running from/to Pulkovo airport, or those going up and down on Nevsky Prospekt. Anastasia while taking a night bus in St Petersburg, Russia. For your information, these night buses in St Petersburg have been launched to cater for all Petersburg residents and visitors like you. They started running along five specially created bus routes, and they cost the same as the day buses. The project was initially working in a test phase, but now, as the project turned out to be successful, we also have night buses running on weekends (Friday-Saturday night and Saturday-Sunday night), with fifteen-minute intervals, almost all year around. The routes are identical to those of the metro, which ensures the connection between the urban districts at night time, when the underground is closed. Surely, for most locals the night buses are now a better option than the paid hitchhiking. Going to/from the airport by bus? If so, read on. If you want to get to the St Petersburg airport, you should take the city bus №39 that goes to/from the nearest Moskovskaya metro station (the bus stop is located at the exit of the arrival hall), and from there take the metro to the downtown area to reach your final destination. The city bus in St Petersburg runs to/from the New Pulkovo Terminal every 12-20 min and the ticket price is 40 Rubles (€0.60/US$0.70), one way. In the event that you land in St Petersburg at night, the only one way is to take a taxi. Previously, you could find also a 24 hour bus route (the express buses K800 and K900) linking both the international and domestic terminals with the city center, but as both old terminals are shut down, this route doesn't operate any more. If you want to tour the city by bus on your own, you're better you take a hop in, hop off red bus tour like those you see all over Europe, though they are not always reliable in terms of schedule. Buses in St Petersburg like any other public transport can be a challenge for foreigners, but at the same time can be also a way to experience the city like a local. In the event you take a bus, remember to pay with only small notes or coins. Don't give more than 100 rubles because the conductor may have no change to give you back . Please note that usually conductors wear special uniforms. If not, you can easily recognize them by their shoulder bag. From Buses in St Petersburg return to Travel in St Petersburg or go to the Homepage.